The birth of Jesus according to the Gospel of St. Matthew is fraught with peril, flight, exile, and murder. Most of us never hear of this drama since these readings are rarely heard during Sunday worship. Christmas pageants performed by children often skip over this part of the story as churches tend to couple Matthew’s “Wise Men” with Luke’s “shepherds” at the manger scene. We do get hints of Herod as the villain in the story. Wily and jealous of any usurper to his throne, Herod pleads the Wise Men to lead him to the new born King of the Jews so that he, too, might worship him. The Wise Men find Jesus and pay him homage with precious gifts. Warned in a dream not to return to Herod, they leave for their home country by another road. Upon discovering that the Wise Men had tricked him, an infuriated Herod orders all male children in the Bethlehem area up to two years old slain. Joseph, warned in a dream, escapes to Egypt with Mary and the infant Jesus where they become refugees in a strange land until it is safe for them to return years later. What is your visceral response to the “slaughter of the innocents?” Do you identify with those who are rescued or those left behind? What contact do you have with exiles and refugees in your life? In what way can this season be a time to support them? 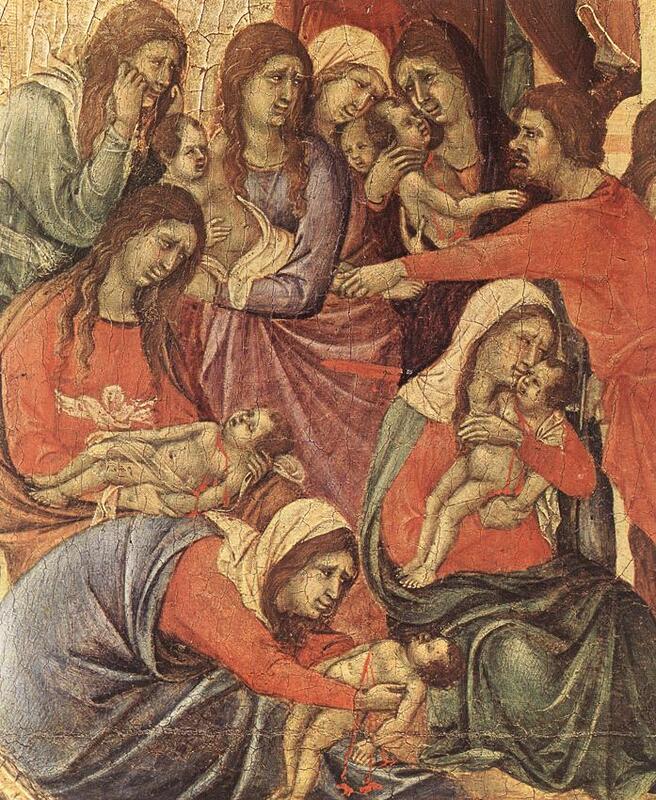 Artwork: Portion of Duccio di Buoninsegna. Maestà (front, predella): The Massacre of the Innocents. 1308-11. Tempera on wood panel. Museo dell’Opera del Duomo, Siena, Italy. This entry was posted in Christmas, Education, Feast Days, Prayers and tagged Christmas, Faith, Feast Days, Jesus, Massacre of the Innocents, Nativity of Jesus, Prayer, Prophets, Stanley Hauerwas, Walter Brueggemann. Bookmark the permalink.